According to the Bureau of Labor Statistics, twenty-seven states had increases in employment for the 12 months ending March 2017. Two states lost jobs over the same 12-month period, while employment remained essentially unchanged in 21 states and the District of Columbia over the year. The largest over-the-year job gains occurred in California, Texas, and Florida (large population states). The largest percentage gain occurred in Utah (+3.2 percent), followed by Florida, Georgia, and Nevada (+3.0 percent each). Only 2 states experienced employment declines (Alaska and Wyoming – low population states). These numbers continue to show that the job market is improving. Presumably, should federal legislation, namely healthcare and taxes, be passed the job market could continue its positive gains. The Bureau of Labor Statistics recently reported that unemployment within families is trending downward. This is good news! In 2016, 6.5 percent of families included an unemployed person, which is down from 6.9 percent in 2015. The Bureau also reported that of the nation’s 82.1 million families, 80.4 percent had at least one family member who was employed 2016. This employment trend and other statistics continue to support the conclusion that the job market is improving. According to recently released information by the Bureau of Labor Statistics, unemployment rates were lower in February 2017 than a year earlier in 274 of the 388 metropolitan areas. The largest over-the-year percentage increase in employment among the metropolitan divisions occurred in Camden, New Jersey, and Dallas-Plano-Irving, Texas (+3.7 percent each). The increase in employment across so many metropolitan areas is good news for job seekers. A robust labor market is shortening job searches and providing opportunities for many job seekers across the country. Jobless claims were down again last week – to 234,000. This indicates that companies are not engaging in lay-offs. This is good news! Claims have now been below 300,000, a threshold associated with a healthy labor market, for 110 straight weeks. That is the longest such stretch since 1970, when the labor market was smaller. According to sources, the labor market may be close to full employment, with the unemployment rate at a near 10-year low of 4.5 percent. Additionally, the average person who has been let go is finding a new job within 60 days in many cases (depending on the level of the position). Statistically, job seekers over 50 have more difficulty finding employment than their younger counterparts. 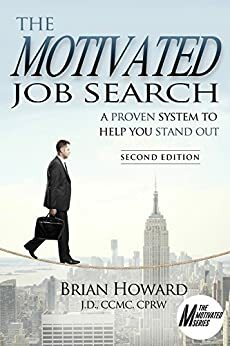 Over 50 and Motivated is a practical no-nonsense job search book specifically written for job seekers over the age of 50. Over 50 and Motivated covers meaningful topics such as dealing with age biases, advantages of experience, how to correctly prepare for a job search, profiling your next job, understanding the employer’s mind, branding, elevator speech, success stories, LinkedIn, resumes, networking, social media, the hidden job market, interviewing, negotiating a job offer, along with a myriad of useful job search tools all written for the job seeker over 50. The book contains motivating success stories and advice from other tenured job seekers over 50 who landed fulfilling career positions despite the obstacles. Here is a link, Sample Pages from Over 50 and Motivated!, to see selected pages from the book. You can buy the book on the publisher’s website, WriteLife Publishing or on Amazon. The Pew Research Center released a recent survey indicating that nearly six-in-ten people in the United States (58%) say the economic situation is very good or somewhat good. The survey was conducted Feb. 16-March 15, 2017. According to Pew, this is the most positive assessment of U.S. economic conditions since 2007, and only the second time that half or more of those surveyed have given the economy a thumbs-up. In comparison, in the spring of 2016, only 44% of the American public described the economy as good. The 2017 results are a 12 percentage point swing in just one year. Optimism about economic conditions is almost always seen as an ingredient to a positive jobs market.